First-grade immersion students from Nitrauer Elementary School work on making syllables from letter combinations. Niños, miramos la cubierta de este libro que vamos a leer. ¿De qué piensan que van a leer en este libro? Thesmall group of average first grade readers huddled around the table, looking at their new guided reading book. Sra. Hall, the first grade immersion teacher, encouraged predictions about the book, translating student responses in English to Spanish, modeling new vocabulary and proper syntax. This group of students was reading a leveled book equivalent to a Reading Recovery level 8 around mid-January. The goal was for all students in first grade immersion to reach the benchmark of level 16 by the end of the year. Much remained to be accomplished. By mid-year, average to above average first grade immersion students have learned many reading strategies. In kindergarten, the Spanish phonetic foundation is established, in part through a sequential writing program, which helps develop phonics, vocabulary, and the rudiments of Spanish syntax. In first grade, the teacher builds upon this foundation with a comprehensive review of phonics at the beginning of the year. The students also review concepts about print, such as reading left to right and top to bottom, use of punctuation, and the difference between sounds, letters, words, and sentences. In learning how to read, English-speaking students draw on three cueing systems: semantics, syntax, and phonics. For them, semantics and syntax have been developing since birth. While the English first grade students are concentrating on learning how to decode (sounding out) through the use of English syntax and meaning, the immersion students must learn the three main cueing systems simultaneously. For example, when reading a book about a horse, an English-speaking student can look at the picture and immediately offer the word horse and can use the word horse in a syntactically correct sentence. TheEnglish-speaking child is learning to listen to the initial sound of the word horse (/h/) and match that sound with the written word horse on the page. As the student becomes more skilled, he will be able to match ending, and then medial, sounds. Through this process, he cross-checks himself, using the cues of syntax and semantics. In contrast, a Spanish immersion student looks at the picture of a horse and can offer the English word horse. However, this will not help him decode the word caballo on the written page. Unlike his English-speaking counterpart, as the immersion student is learning how to decode the word caballo, he is also learning the meaning of the word. In addition, he is still learning about Spanish sentence structure and syntax. Fortunately for Spanish language learners, Spanish is very phonetically consistent. Most Spanish immersion students acquire the decoding aspect of learning to read without much difficulty. Nevertheless, there are students who struggle. In our Spanish immersion program we see and remediate many types of reading difficulties with our early readers. Often students confuse the two languages, by reading Spanish words with English sounds. This is especially true with students who are still in the letter naming stage, and have not internalized the sounds that letters make. Additionally, students may know the sounds of letters in isolation, but have a difficult time combining the sounds into syllables and the syllables into words. Also, many of our second language learners have difficulty retaining the meaning of Spanish words, once they have been introduced. Even with repeated usage, some students cannot remember what words mean when they come to them in a sentence, thus impairing the comprehension of the text. Diminished fluency is often a result of these difficulties, which, in turn, also impedes comprehension. To remediate these reading challenges, we use many different strategies. The strategies are not new or unique to immersion. However, we have found that we may implement the strategies in a slightly different way to meet the unique challenges of learning to read in a second language. Guided reading for ms the core of both our first grade immersion reading program and our remediation program. In the classroom, small, flexible groups of students meet three to four times a week with the teacher to read and interact with a specifically chosen text. The text is matched with the level of the readers in that group. Additionally, the teacher selects a teaching point based on the text. Examples of teaching points are the use of punctuation, sentence structure, grammar usage, and vocabulary. The text is usually a small, leveled book with pictures on most pages, and somewhat controlled vocabulary and sentence structure. Most of the texts are translations of English guided reading sets. At times, this poses some difficulty, as translated words can be much more difficult than what was originally intended for that level of text. However, we have found them to be generally useful for developing basic vocabulary and semantics. For students who need reading remediation, guided reading is also used. This allows the students three to four more exposures to Spanish text at their reading level every week. This increase in exposure does a lot to aid some struggling readers. In addition, the reading specialist can review letters, sounds, and vocabulary on a more individualized level with each student. Much emphasis is placed on reading completely through the word, and fluently re-reading words and sentences once they have been decoded successfully. There is a lot of repetitive practice. Another strategy that we use in our first grade immersion classroom is Making Words. This strategy is very helpful in reinforcing sound blending which leads to fluency. While this strategy can be done with the whole class, we find it to be more manageable and productive with a small guided group. The teacher gives each student a predetermined set of letter cards. The teacher then guides the students to make smaller words or syllables with their letters. These chunks are then combined to make longer, multi-syllabic words. For example, the teacher distributes the letter cards c, m, s, i, a, a to the students. First, she asks the students to make the word mi and then asks the students to form the syllable sa. This is followed by having the students combine the two chunks to make the word misa. Finally, the students are asked to take the remaining letters and combine them with misa to make camisa, the Spanish word for shirt. Other words that could be made from these letters include casa, saca, and cima. For students needing additional reading remediation, the reading specialist uses the Making Words strategy to reinforce patterns and vocabulary taught in the classroom, as well as text used for guided reading in the reading support classroom. The same procedure is followed as in the classroom, but with different words and syllables. This helps struggling readers to generalize and to develop fluency. The reading specialist often sends home letter cards for specific words in a guided reading text with the first graders. This allows the students to practice their skills at home and helps parents learn an easy way to support their young readers. First-grade teacher Jodie Hall works with an emerging reader at Nitrauer Elementary. A tried but true recipe that we find successful to implant vocabulary is the use of flashcards, matching word with picture. 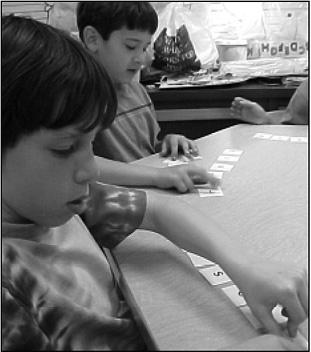 Games such as Concentration and Bingo are effective and fun for first graders. For students needing additional remediation, the reading specialist initially focuses on high frequency words such as the days of the week, months of the year, colors, shapes, etc. Patterned writing is also effective for solidifying frequent patterns in Spanish such as me gusta for which students often use the horrifying yo me gusta. For a percentage of all students, early literacy learning can be challenging in the first language. For immersion students, this challenge is even more complex and demanding. With the use of the practices outlined above, the majority of our Spanish immersion students acquire the skills to transition into reading authentic literature.